The tabs on this Q-Connect fifteen part divider have been left blank to allow you to customise it with your own labels. Each sheet is a different colour, enabling you to colour code your documents as you wish. 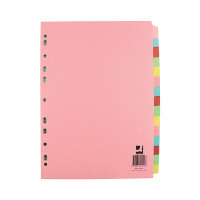 It has been multi-punched to fit standard A4 ring binders and lever arch files.